Andalusia Travel Blog Guide: Plan your Best Andalusia Holiday! Planning a trip to Andalusia? In this Andalusia Travel Blog we explain where to stay, the best things to do in Andalucia, the best beaches, and what to see on your Andalusia Holiday. Read here everything you need to know for your trip to the South of Spain! Andalusia is one of the most popular holiday destinations in Europe. Glorious summers with blue skies, tasty cheap food options, the diversity of landscapes, friendly people, and some of the most extraordinary cultural attractions make Andalusia a well rounded destination. 1 Andalusia Travel Blog Basics: Where is Andalusia? 5 How Many Days Should you Stay in Andalusia? There are many lookouts in Andalusia, as this is a mountainous country. One of our most favourite ones is the views all the way to the coast in Mijas Pueblo. Mijas is just a ten minutes’ drive outside of Fuengirola and a great day trip destination from Malaga and the resorts on the Costa del Sol. Andalusia Travel Blog Basics: Where is Andalusia? Andalusia is an autonomous region in the south of Spain. It’s the second biggest, in fact. It borders the Atlantic Ocean to the west and the Mediterranean to the east. It is indeed a truly diverse and scenic destination with lots of options for visitors. The capital is Seville, a buzzing metropolis which used to be the receiving port for the golden treasures of the newly discovered Americas. 8.44 million people call Andalusia their home. Most of them are centred around the cities of Seville, Malaga and Cadiz as well as along the Costa del Sol. Andalusia looks back at a varied history of Roman, Phoenician, Moorish, and Christian occupation. You can still explore this in its many cultural treasures such as the Alhambra, the old town of Cordoba, or the Roman theatre in Malaga. Andalusia is divided into eight provinces, Seville, Malaga, Cadiz, Granada, Cordoba, Almeria, Jaen, and Huelva (from the most populated to the least). Each one of them has very distinct features and offers reasons why you should visit. People in Andalusia speak Castilian Spanish. However, they have a very strong dialect which may throw you off even if you consider yourself a good speaker of Spanish. Main characteristics of the Andalusian way of speaking Spanish is the dropping or aspiration of the sounds “s” and “d” in the middle or at the end of a a word, for example “ma or meno” for “mas or menos”. The gardens of the Alcazar in Seville are just as popular as the buildings next to them. They became known to a much wider audience outside Europe when they were used as a backdrop in the famous TV show Game of Thrones. Andalusia offers something for everyone. It really depends on what you want to do and see while in the region. If you are looking for a relaxed holiday under the sun with the occasional dip in the ocean, then the Costa del Sol in the south or the Costa de la Luz in the west will be your preferred choice. If you are after unique scenic experiences things to do in Andalucia and love active or eco tourism then some of the many nature parks will be your top choice. Cabo the Gata in the east near the city of Almeria is a lava landscape with a semi arid climate which offers some of the most dramatic cliff views in Europe. Sierra de Grazalema is the rainiest region in all of Spain where you will find some of the most enchanting white villages. If you would like to learn how to kite surf then look into Tarifa on the southern most tip of Spain. The best way, however, to experience the many worlds of Andalusia and its rich and historic landscapes is by planning a round trip of several days. This way you can visit some of the oldest or most romantic cities and towns of Europe. 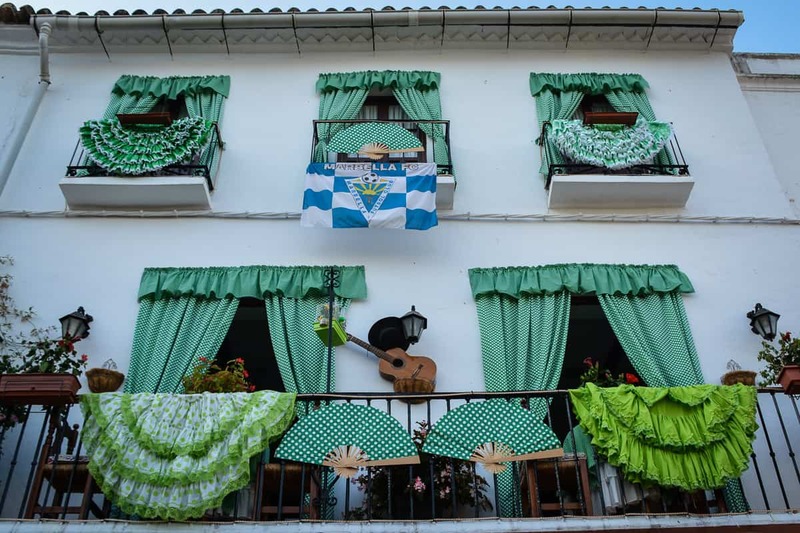 In the following, let’s look at some of the most popular regions to stay in Andalusia, and some hotel suggestions for each. The cave houses of Setenil de las Bodegas are a fun and off-the-beaten-path destination just outside of Ronda. A visit to this small town can easily be added to the trip to Ronda. While Ronda is very busy with visitors from all around the world, Setenil is still largely untouched by international tourism which is a blessing. The Costa del Sol is one of the oldest, if not the oldest, tourist region in Spain. Developed since the 1960s, it has some really nasty pockets of mass tourism. But there are also some highlights, and some areas haven’t seen the same degree of development as the worst areas at all. 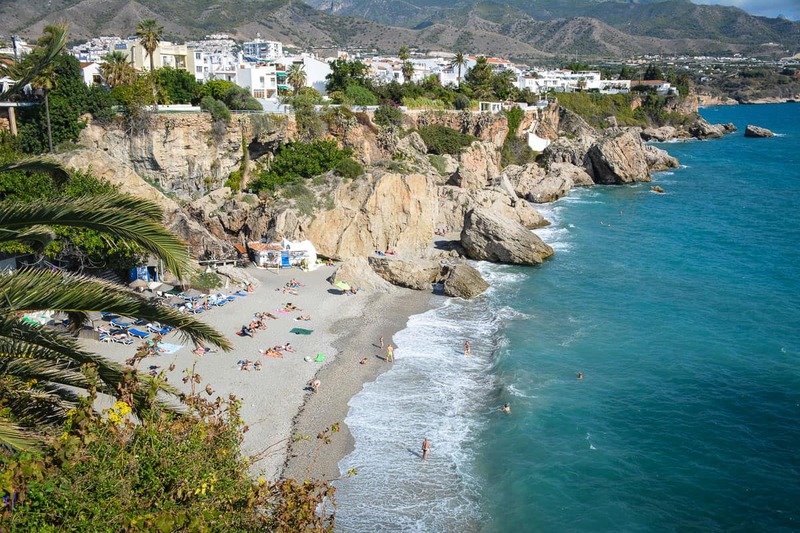 When looking at the eastern part of the Costa del Sol from Malaga to the Province of Granada, you will still find some very quiet and enchanting tourist centres such as Nerja and Torrox. The western part of the Costa del Sol has seen more development and offers a bigger choice of anonymous hotel beds. There are also lots of fun and party options for the whole family. 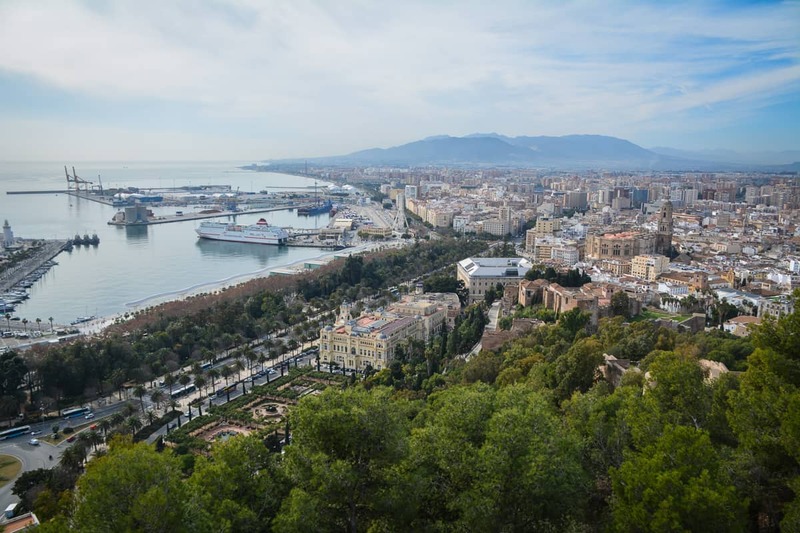 There is even a train service connecting the tourist resorts of Fuengirola, Benaldmadena and Torremolinos with the province capital, Malaga. Further on, things become quieter again until we reach the hip jet-set town of Marbella with its posh marina and quaint old town. Estepona is another popular tourist resort that many people will favour who are looking for a relaxing stay under the Spanish sun. It must be stressed that the Costa del Sol is not home to the most beautiful beaches of Spain. If you are after dreamy beach locations with soft white sand and palm fringed backdrops on your Andalusia holiday then you will be disappointed. There are, of course, lots of beaches to be found along the Costa del Sol. But they are very urban, quite busy, and don’t have the quality of sand that you may wish for. Having said that, the local communities are keen to offer clean conditions and family-friendly experiences throughout the Costa del Sol. Many beaches, even in built-up areas, are regular receivers of the prestigious Blue Flag denomination. Views from the Giralda in Seville. You can clearly see the Orange Tree Courtyard which used to be part of the mosque that the cathedral replaced after the Reconquista. Did you know that the Giralda does not have any stairs? You walk up a ramp to get to the top! The former fishing village of Nerja is one of those places along the Costa del Sol which have managed to retain a lot of flair and character. This is why it needs to be featured in our Andalusia Travel Guide. The centre of town may serve predominately the tourist crowd from Central and Northern Europe, but the houses still retain their original character and are a joy to look at. Check out Calle Pintada and surrounding streets for souvenirs. In the centre of town is the Balcony of Europa, a cliff lookout with some dramatic views of the coast and the local beaches. Nearby, the Caves of Nerja are a popular tourist attraction for Andalusia holidays and are considered one of the best cave systems in Spain. MB Boutique Hotel: A lovely modern hotel in the centre of town with a rooftop terrace and large jacuzzis. Click here for reviews, photos and rates. Hotel Puerta del Mar: This little gem of a two-star hotel is located in a small side street and has a rooftop bar and pool. Just two minutes from the Balcony of Europe. Click here for reviews, photos and rates. Hotel Villa Flamenca: Recently refurbished hotel with rooftop terrace and in walking distance to Burriana Beach. Breakfast includes freshly made omelettes. Click here for reviews, photos and rates. Torrox is built on the ruins of a Roman port city and today offers the longest beach promenade of the Costa del Sol. It has everything you could wish for in a beach holiday. Plus, there is the added bonus of Roman ruins such as a necropolis, the remains of a luxurious villa, and thermal baths. It is said to have the best climate of Europe. Cool winds from the sea tend to take the edge off the Andalusian summer heat. In its centre is a typical Andalusian village with charming whitewashed houses and narrow streets. The lighthouse with interpretation centre is well worth a visit. Iberostar Malaga Playa: Fantastic family-friendly hotel complex with mini-club, animation team, and evening entertainment. All-inclusive options available. The beach is just through the garden gate. Click here for reviews, photos and rates. Hotel La Casa: Romantic boutique hotel with lovely rooms and terraces with views over the river valley. Set in a village setting with cute narrow streets. Click here for reviews, photos and rates. Hotel Rural Cortijo Amaya: Charming and relaxing country hotel with honesty bar, pool, and tennis courts. Click here for reviews, photos and rates. Caminito del Rey is a popular day trip destination on the Costa del Sol. The path is not dangerous at all and can even be mastered by children as young as 9. You will need to book your tickets well in advance as the walk has become extremely popular not just with tourists but also with locals. Torremolinos is where it all began for the Costa del Sol. Located just on the outskirts of Malaga, it is one of the most densely populated parts of the coast. You will find here 7km or dark family-friendly beaches, a busy shopping district, some old town flavour and a bit of a concrete jungle. It’s a quick and easy choice for holidaymakers who don’t want to venture too far from the airport and who are happy with sunshine and beach alone. Popular Andalusia holiday destination Torremolinos is also home to lots of things to do such as a Botanical Garden, a Crocodile Park, and the summer palace Casa de los Navajas. Hotel Tarik: A three-star seafront hotel with pool and excellent customer service. Click here for reviews, photos and rates. Hotel La Luna Blanca: Small Japanese style hotel with an air of understatement, 10 minutes by foot from the Paseo of la Carihuela. Click here for reviews, photos and rates. Melia Costa del Sol: Excellent hotel by a big hotel chain which is located right on the seafront, perfect for a relaxing family holiday. Click here for reviews, photos and rates. Located right in the centre of a densely-populated western Costa del Sol, Benalmadena offers a lot of choice. There is a wealth of beaches, attractions, and things to do. One of the highlights is a ride with the cable car up the mountain where you can take part in a show with birds of prey. There is even the highest stupa in the western world in Benalmadena, of all places. Thanks to the suburban train you get quick and easy access to other towns along the coast and to Malaga city. 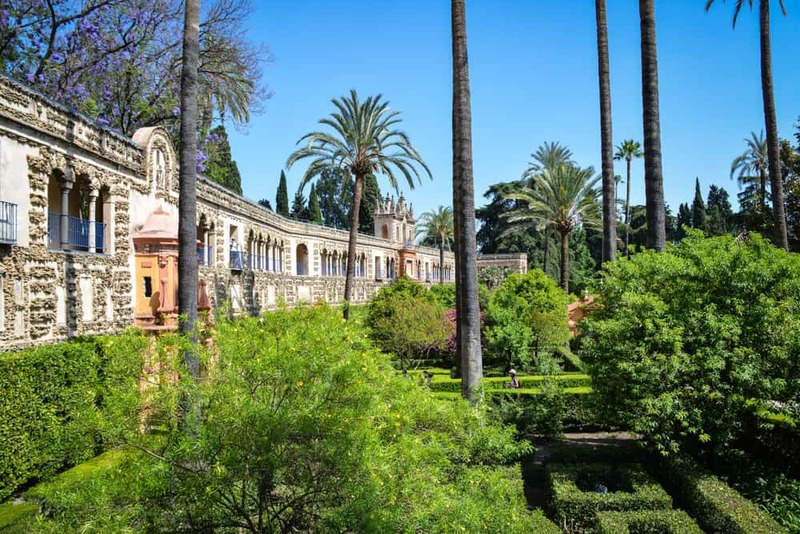 The best things to see in Benalmadena include the Paloma Park, the marina, the old town of the pueblo, the Butterfly Park, Castillo de Colomares, and Tivoli World. Vincci Selection Aleysa Hotel Boutique & Spa: Most popular hotel in Benalmadena, with large rooms, sea views if you prefer, and a buffet with chocolate fountain. Click here for reviews, photos and rates. Las Arenas Hotel: A great family-friendly hotel just across the road from pretty Bil Bil Castle, a former private residence in Moorish style that has been turned into an events centre. Click here for reviews, photos and rates. Hotel Los Patos Park: Perfect family hotel with large pool areas, a kids club and plenty of choice from the breakfast buffet. Click here for reviews, photos and rates. Fuengirola is the last stop on the suburban train line from Malaga. It does have an old town but it lacks the charm of the white village appeal of other towns that have seen similar development over the last 50 years. Still, one cannot deny that Fuengirola has something to offer for everyone. There is a string of beaches, a marina, a castle ruin, some pretty squares in the old town, and Mijas Pueblo just up the mountain. Family-friendly attractions include Aqua Mijas and Bioparc Fuengirola. Hotel IPV Palace & Spa: Just a gate separates the pool and garden of this hotel from the beach. Wake up with churros for breakfast from the buffet and get lulled to sleep by the sound of the waves. Click here for reviews, photos and rates. Florida Spa: An excellent hotel in central location and just steps from the beach. Memorable evening entertainment and gorgeous views from rooms on the upper floors. Click here for reviews, photos and rates. Yaramar Hotel: A beachfront hotel in charming quarter of Los Boliches, with pool, patio bar and evening entertainment. Click here for reviews, photos and rates. A very pretty house in Marbella. Marbella’s old town is quite enchanting and much more than what you would expect. This is not just a jet-set destination but also a pretty white village with all the works. Beautiful Marbella is more than just a jet-set destination, although one has to admit that the marina and the clean swept streets leave the unusual impression of elegance and luxury in even the most unassuming corner of town. Expensive clubs and boutiques aside, Marbella has a very charming old town. The beautiful Plaza de los Naranjos is perfect for people watching. The beach is never far, and up and down the coast there are a couple of options if you feel like spreading out a bit. Hotel Claude Marbella: A very quiet, relaxing luxury boutique hotel with roof terrace in the centre of town. Click here for reviews, photos and rates. La Villa Marbella: A charming hotel spread out over several buildings. Asian style rooms, some with four-poster beds and private rooftop terrace with small pool. Click here for reviews, photos and rates. Marbella Club Hotel: Five-Star golf hotel with kids club and large pool area in what is called “The Golden Mile”. Right on the beach and with a variety of restaurants and bars to choose from. Click here for reviews, photos and rates. Estepona is a year-round Andalusia holiday destination with quite a few attractions to look out for. Check out the ancient clock tower, the bull ring, the Castle San Luis or the Los Pedregales Park. It is actually closer to Gibraltar airport than to Malaga airport, although there are currently only limited connections from the UK. There are two beaches and a marina, offering lots of different things to do while you there. Bigger hotel complexes and resorts tend to be located a bit outside of town. Marriott’s Playa Andaluza: Resort hotel with a host of entertainment options and activities to choose from, perfect for Andalusia holidays. Even includes an indoor pool for winter. Click here for reviews, photos and rates. Kempinski Hotel Bahia: Beautiful hotel with magnificent views and convenient beachside location. Excellent service, relaxed atmosphere, kids club and beach restaurant with a friendly team. Click here for reviews, photos and rates. Iberostar Costa del Sol: Perfect family hotel right by the beach with pool, indoor pool in winter, spa, gym, and great dining options. Click here for reviews, photos and rates. The Puente Nuevo in Ronda is the most prominent attraction in town. But there is so much more to see in Ronda, you could easily spend a couple of days here and won’t get bored. A must-do is a hike to the bottom of the gorge to see the bridge from below. If you think about following the suggestions in this Andalusia Travel Blog post, you can either rent a car or book one of the tours. This way you can explore some of Andalusia’s most interesting day trip destinations. With Costa del Sol your base, there are many options that will show you a very unique and original side of the South of Spain. The following day trip locations in this Andalusia Travel Guide are our personal selection of places to visit. You can either organise your visit yourself, or very often you will find local tour operators for will take you to the destination for a fee. The city of Ronda is located on a high plateau overlooking the beautiful rural landscape of inner Andalusia. Its two old parts are connected by a dramatic 140 metre tall arched stone bridge, the Puente Nuevo. Most people will want to visit Ronda just to enjoy the views from the cliff-side parks and the views of the bridge from the bottom of the Tajo Gorge. But Ronda has more to offer. There are many relicts of the Moorish influenced past such as the Arab Baths, fascinating palaces such as La Casa del Rey Moro, various churches, a bull fighting museum, and lots more. 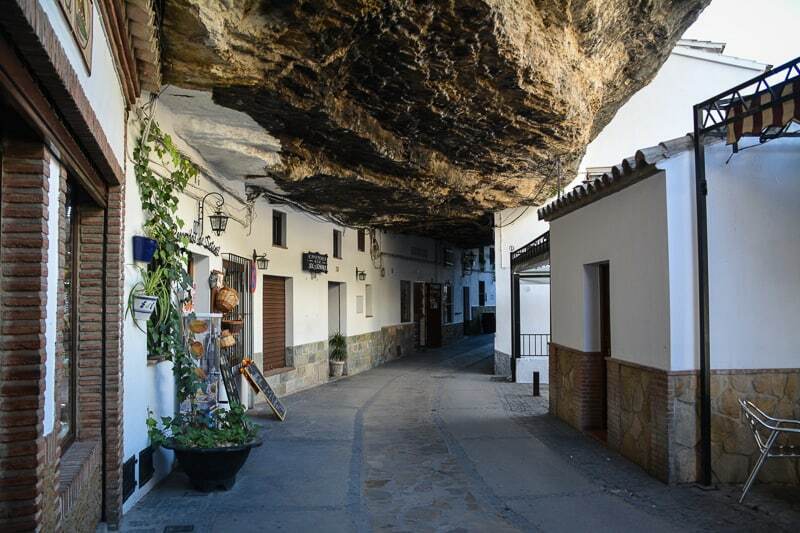 This unique village is located just outside of Ronda. While Ronda seems to get all the attention, Setenil is largely unknown to international visitors. This of course adds to the charm of the place which comes with all the regular features of a typical Andalusian village of whitewashed houses and Moorish ruins. Its best part are the rows of cave houses built under a rock ledge along the river, which today house a number of bars, restaurants, and shops. You can easily walk inside some of the houses and have a look around. Maybe buy a decorative ceramic plate from the area or snack on some freshly prepared tapas. It’s a great destination to combine with Ronda when you are self driving. We wrote about Setenil here. Just outside from Nerja, Frigiliana must be one of the most beautiful white villages along the eastern Costa del Sol. Expect to climb many steps to see the full offering of the village. Your reward will be fantastic views of the lush green valleys all the way to the Mediterranean Sea. The roads are so steep and tiny that no car will ever disturb the silence. Just lose yourself on your Andalusia holiday in the charming atmosphere of this village with its potted geraniums and hand-painted wall tiles. The capital of the region, Malaga, is a real surprise. It may be a busy port town, but the local government has put a lot of effort into beautifying and improving the infrastructure of the city. There are a lot of things visitors can do. Today, the pedestrianised roads of the city centre are definitely worth a stroll. You cannot go past the lovely cathedral with its missing bell tower and the ruins of the Roman theatre. If you are interested in the Moorish past of Malaga, make the effort to climb up to the Alcazaba where you can see a well preserved Moorish castle, palace and gardens. Along the harbour front, there is a new development with family-friendly restaurants, parks and shops. Pablo Picasso was born in Malaga, and the city is home to a first-class Picasso museum. Mijas is one of the best villages to visit in Andalucia. It is a pretty little white village with lots of sunny squares and great vistas up and down the coast. It’s well developed and appeals to the more sophisticated taste of travellers. There are many boutiques, wine shops and craft shops to browse. And if that’s not enough there are quite a few churches, museums and Moorish ruins to explore as well. 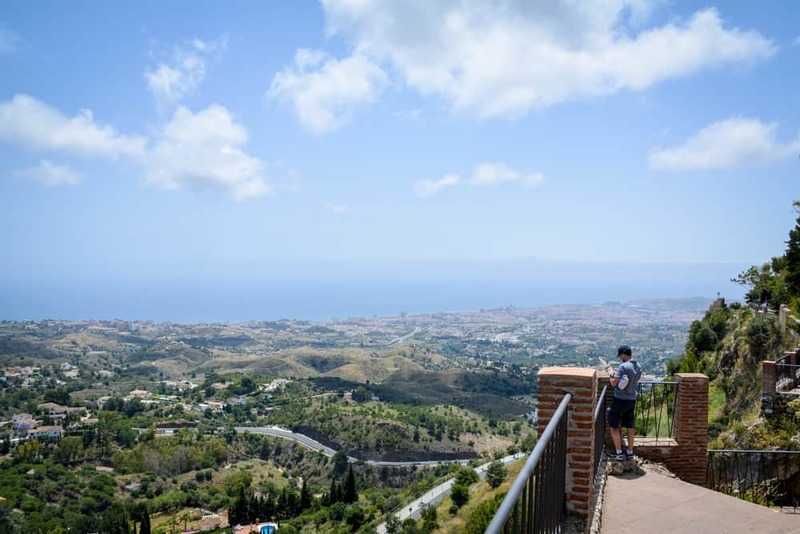 Mijas is best enjoyed while sitting on a terrace overlooking the Mediterranean coast from a distance while listening to the conversations in a dozen languages all around you. Robert Redford loved it so much, he lived here for a while with his family. We wrote about Mijas here. One of the palaces of the Alhambra in Granada. Water and light play an integral part in Arab architecture. You can see water reflecting buildings, cooling the air, adding the trickling sound of water drops, and painting patterns of light on the walls and floors of rooms. The city of Granada is home to probably the best known attraction of Andalusia, the Alhambra. The palace complex alone is already worth the trip, and visitors should plan at least half a day just to visit the castle, the palaces and the museums of the complex. If you are not tired by then, take a taxi down to the old town of the Albaicin and explore the enchanting old corners with the heavy Moorish influences. If visiting the Alhambra it is essential that you prebook your ticket weeks in advance to avoid disappointment. Read here everything you need to know if you want to visit the Alhambra. 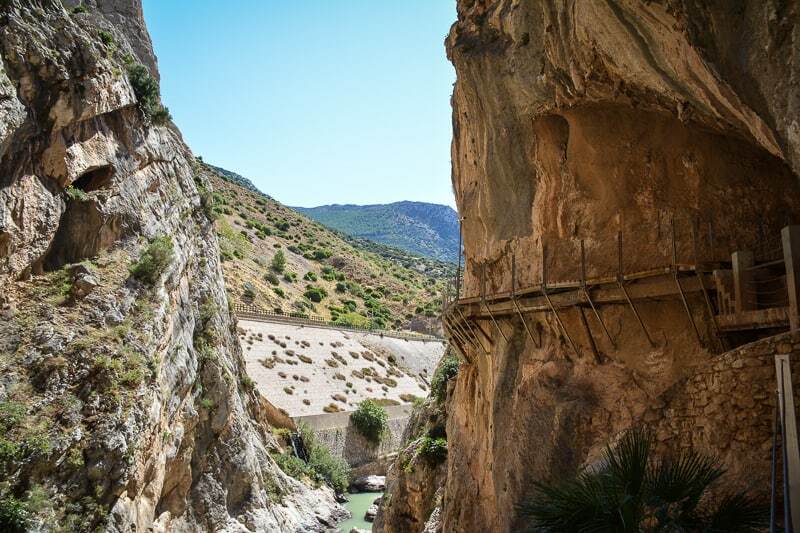 One of our top things to do in this Andalusia Travel Guide is the Caminito del Rey. The former most dangerous hiking trail in the world is today totally fine to walk even with children from eight years of age. The path hangs off the face of a steep cliff, some 100 metres above ground and offers some of the most dramatic and most scenic views of the Andalusian mountain landscape. A highly recommended experience which you will have to book in advance as numbers are limited. We wrote about the experience here. 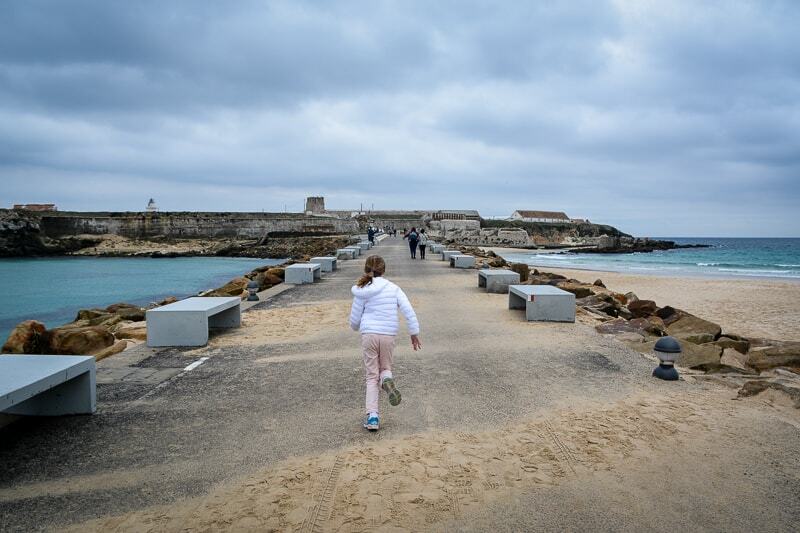 Winter atmosphere in Tarifa… This walkway separates the Mediterranean Sea from the Atlantic Ocean. While the Costa del Sol is dominated by urban centres with tall apartment buildings and big hotel complexes, the Costa de la Luz has a decidedly more natural and virgin feel to it. Long stretches of soft white sand make up the major part of this coast from Tarifa to Huelva with the city of Cadiz in its centre. This is why it definitely needs to be featured in this Andalusia Travel Blog post. The major difference between both coasts is that the Costa de la Luz borders the Atlantic Ocean. This has a great influence on the climate (less heat, more temperate climate), the wind (bigger waves and onshore winds, ideal for surfing, windsurfing and kitesurfing), and the landscape (large dunes, the wetlands of the Coto de Donana, and large mediterranean pine forests). Lots of smaller villages and hamlets dot the coast. For centuries the people of the Costa de la Luz have existed on fishing and trade, all the way back to the Roman and Phoenician age. They still very much resemble the quaint fishing village of the olden days and charm visitors with their little churches, whitewashed houses and ancient watchtowers. It’s the perfect place for camping in natural surroundings, to pursue sports activities, and to explore the rural hinterland with its white villages, horse studs, and brandy manufactures. Read here in our Andalusia Travel Guide about places to stay and what to see on the Costa de la Luz. Beginning from Easter each year tourists from Spain, North and Central Europe flock to pretty Chicana to experience the wild coasts and beautiful landscapes of the region. The town covers a bigger area, with Playa Barrosa and Novo Sancti Petri being two of the major tourist centres in Chiclana. Golf is a popular activity for visitors. There are now many great golf courses nearby. Another popular thing to do is check out the many small bodegas which sell locally produced wines. Melia Sancti Petri: Pretty beachfront hotel with golf course, garden, and large pool areas. Great place to disconnect for a few days. Click here for reviews, photos and rates. Iberostar Andalucia Playa: A classy and elegant hotel right on the beach, offering everything you could wish for in a relaxing holiday. The beach here is shallow and great for kids. Click here for reviews, photos and rates. Royal Hideaway Sancti Petri: Wonderful resort with lots of options such as a large outdoor pool, beautiful gardens, large spa. There is a surf school nearby. Check out the apartments with rooftop jacuzzis. Click here for reviews, photos and rates. Conil offers a mix of long white beaches and dramatic cliffs and is a popular Andalusian holiday destination, in particular in summer. You will find a wealth of historic buildings here. There are all more or less connected to the times of the Reconquista, for example a military fort and the Guzman Tower. It is featured in the Route of the White Villages which is promoted by Cadiz Tourism. Most hotels are located on the northern fringe of the town, thus preserving the unique character of a fishing village in the centre. Hipotels Gran Conil and Spa: A great hotel with indoor and outdoor pools. Lots of activities and entertainment without being invasive. Families can request rooms with interconnecting door. Click here for reviews, photos and rates. Hotel Fuerte Conil: Stunning hotel with a large pool area, just a couple of metres from a beautiful beach. Great choice for families and couples alike. Click here for reviews, photos and rates. Hotel Andalussia: A lovely smaller design hotel near the old town of Conil. You will need walking shoes or a car to reach the waterfront, however the pool has a good size and there are plenty of areas to catch a few rays. Click here for reviews, photos and rates. A major centre for tuna fishing, Zahara de los Atunes must not be confused with similar named Zahara de la Sierra. Located near the city of Tarifa, Zahara offers some of the best beaches on the Costa de la Luz. There is the added bonus that you may see all the way to Gibraltar and Africa from here. It is yet to see a rise in tourist interest and thus still retains a very original character of a fishing village. You will find only few hotels and apartment complexes here. In the summer months, there is an interesting hippie market. Some Roman ruins also remain. Hotel Porfirio: A small yet comfortable hotel in the small village of Zahara. Easy walk to the beach and many good restaurants. Click here for reviews, photos and rates. Melia Atlanterra: Excellent hotel with a beautiful swimming pool, just a short taxi ride from town. Guests have complained about the noise levels in summer, so if you are not a party person, this may not be for you. Click here for reviews, photos and rates. El Cortijo de Zahara: Quiet and relaxing property with amazing views. About 10 minutes walk to the beach, and a bit away from the centre of town. Click here for reviews, photos and rates. Views of Cadiz from the Tavira Tower. There are around a hundred towers in the city, all built by merchants who were eagerly awaiting their fleet’s return from South America. 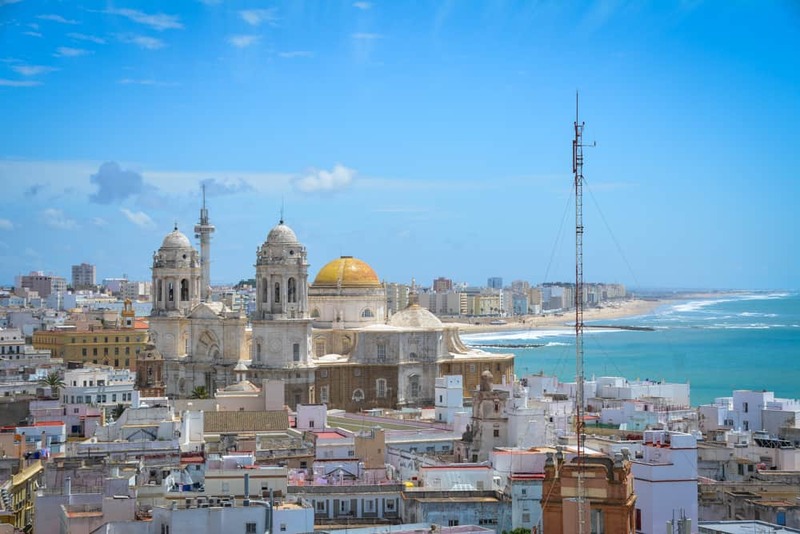 The city of Cadiz is a wonderful day trip destination with its lovely baroque city centre and wonderful seafront attitude. Visit the cathedral and the local city museum, climb on top of Tavira Tower and visit the Castillo of San Sebastian. We wrote about Cadiz here. This national park is one of the most important wetlands in Europe and a crucial stop for birds on their migration routes to and from Africa. A visit makes sense in particular in autumn, winter, and spring when there is plenty of water and flocks of migrating birds. Access the park through the visitor centres for a walk to various lookout points. Or join a jeep or boat tour from nearby Sanlucar de Barrameda. The red Rio Tinto. Like in so many other places in Andalusia, mining was already done on an industrial scale by the Romans. 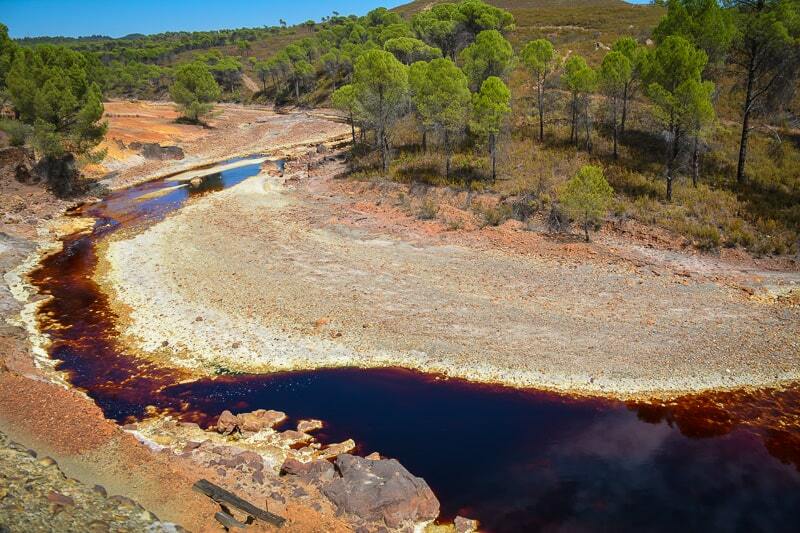 Here in the Huelva region, iron, copper and gold were just some of the minerals mined for consumption and export. The historic mining area around the Rio Tinto is where British mining company Riotinto took its name from. Many decades of mining operations have changed the landscape profoundly. You can visit some of the historic buildings and join a tour through a former mine. However, we particularly recommend a ride with the historic mining train which follows the red Rio Tinto for around 12 kilometres. Read here about our experiences of the Rio Tinto. One of the top things to do in Andalucia, this travelling route is designed by the tourism office to lure coastal visitors onto a rewarding expedition to the most beautiful white villages in the region. There are two itineraries to choose from. Both include some of the most stunning villages such as El Bosque, Zahara de la Sierra, and Grazalema. For further information, see the Cadiz tourism site. Tarifa has always been a strategically important place, which is why we need to feature it in this Andalusia Travel Guide. The city comes with a haunted atmosphere thanks to the strange looking watch tower and the abandoned yet cordoned off military area at the very southern tip of the continent. Visit the impressive medieval castle of Guzman El Bueno for some history. Watch the kite-surfers and horse riders on the beach on a sunny day. In the evening, soak up the hip atmosphere in the surfer bars of the old town and watch the blinking lights of Africa on the other side of the Straight. There are regular car ferries to the African continent departing from Tarifa. We wrote about Tarifa here. 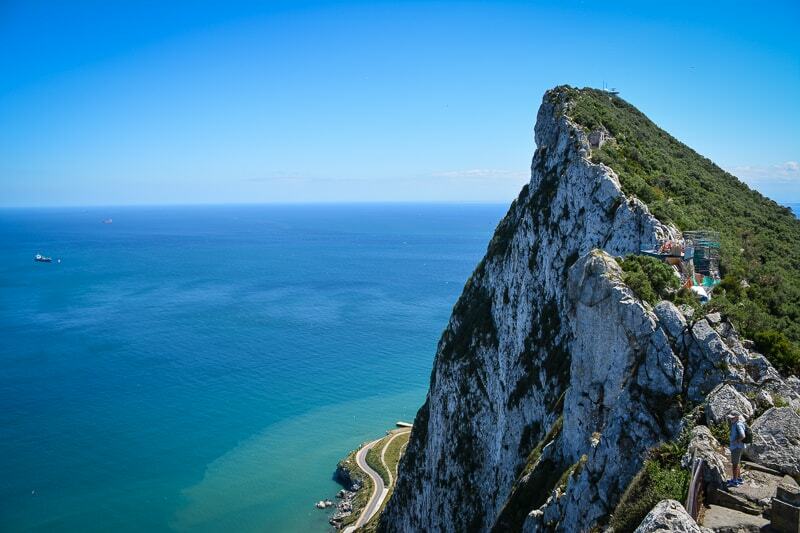 The Rock in Gibraltar, another great day trip destination when on Andalusian holidays. Gibraltar is not just interesting for tax-free shopping, there is also plenty of military history to explore. And who could resist the cute monkeys on the Rock? Just a day trip away, yet a different world altogether. There are indeed quite a few things you can do and see in Gibraltar besides shopping, eating fish’n’chips and climbing the Rock. Meet the monkeys, see the war tunnels, and visit some of the colonial churches in the town centre. Don’t forget your ID when crossing the border and check with your rental company if it’s ok to take the car into Gibraltar. Check out our post about how to plan a day trip to Gibraltar. Beautiful Jerez is the capital of two major themes in Andalusia, horses and sherry. So if you are interested in either or both, a day trip to Jerez is a must. Visit some of the vineries in the surroundings (bodegas) or the Royal Horse Riding School. Other sights include the fortress, various churches, convents, and museums. There is the right beach for everyone in Andalusia. If you are after endless stretches of white sand with big waves and rolling dunes, then the Costa de la Luz will be the right place for you. Should you prefer quiet coves with high cliffs that shelter the beach from rips and currents, the have a look at the beaches of the Cabo de Gata nature reserve near Almeria. In need of fun and family-friendly infrastructure nearby, opt for the Costa del Sol. Our Andalusia Travel Guide lists all the best beaches you can find in Andalusia, by region. Playa El Palmar: Considered one of the best beaches in Andalusia, this beach offers plenty of space and you can even make your dream of horse riding on soft sand a reality. Playa de Zahara de los Atunes: A great choice if you like to try freshly caught local tuna right on the beach. Good choice of beaches, all rather free of visitors, with a more remote option further south called Playa de los Almenanes. Playa de Bolonia: Bolonia is a hip little beach village with an endless stretch of beach topped by a 30 metre tall sand dune. Perfect for kite surfing and textile-free sunbathing. Playa del Cañuelo: Exceptional beach on the Costa del Sol in a small pocket of nature reserve. A steep walk takes you down to the water (a shuttle bus in summer). Great for snorkelling, two restaurants, child-friendly. Playa de Muertos: Surrounded by national park, this deserted beach is great if you want to get away from it all. It’s a sheltered bay at the end of a 20-minute footpath. No facilities. Playa de Mosul: 400 metre long beach with a landmark lava rock right in the middle. Featured in Indiana Jones and the Last Crusade. Close to the village of San Jose. No facilities. Playa de los Genoveses: Horseshoe shaped bay framed by tall cliffs near San Jose in the middle of the nature reserve. No facilities. Granada in winter is just as pretty in summer. For city trips, it makes sense to visit Andalusia in the off-season as some inland cities like Granada and Seville can easily reach 40 degrees on summer days. It’s no secret that Andalusia is perfect for everyone trying to escape the long, grey winters of Northern Europe. Many European retirees choose to sell up their home up north to spend their last years under the warm Andalusian sun. Even in winter, temperatures are generally mild and pleasant. And while you may not be able to use the hotel pool or swim in the ocean, there is still a lot of things you can do during these cooler months. Winter is perfect for active tourism and cultural escapes which is why we dedicated a whole chapter in this Andalusia Travel Blog to the cold season. Golf, horse riding, hiking, mountain biking and many other sports can be best pursued now that the weather is not too hot and the landscapes have the glow of morning dew. With a minimum of six hours of sunshine per day, an outdoor lifestyle is definitely the way to go. Some people even choose to visit the Sierra Nevada for skiing. It is the second highest mountain range in Europe after the Alps and offers some excellent skiing options during the winter season. Cities such as Seville and Cordoba are less busy in the winter months. But they still offer a wealth of attractions that are open all year round. Without the crowds and the heat you can rest assured that you experience Andalusian culture at its finest. We wrote about Granada in winter. Spring in Andalusia can come rather fast and unexpected. From around March onwards, temperatures are constantly on the rise, as well as the hours of sunshine in a day. It is still a great time to be active and explore the countryside and the cities. Highly recommended in particular if you don’t have kids and can choose to travel outside the school holidays of various European countries. While it will definitely be warm enough to spend the day on the beach you may not yet be able to go for an enjoyable swim. In the evenings you may still need to wear a light jacket. March is the wettest month in Andalusia, but the rainfall map is very irregular, and it doesn’t necessarily mean that it will rain along the Costa del Sol. Summer is peak holiday season in Andalusia. Most people will now visit the Costa del Sol to relax in the sun, go swimming in the sea, and party at night. Days can be very hot, and even night temperatures will hardly drop under 20 degrees. You can still plan for a day trip to one of the big cities. But don’t be surprised by temperatures hovering around the 40 degrees mark. Hotels and other accommodation options will now be booked out and expected rates to be according to demand. Many families love the Costa del Sol because of the many family-friendly options and attractions. During the Scandinavian and British school holidays hotel beds will be in high demand. We wrote about Seville in summer. During the autumn months temperatures will still be generally warm and pleasant, occasionally even hot. The water temperatures will still benefit from the long summer days. There is no reason why you shouldn’t be able to go for an occasional swim even in autumn. Most families will have returned to their home countries. They leave behind a more relaxed crowd of empty-nesters and young couples without children. In our view, it’s the best season for an Andalusia holiday as it offers the best of both worlds. It’s pleasant enough for beach holidays. Yet at the same time you can plan a round trip or a day trip to explore some of the cultural and historic treasures of the region. Inside the Mezquita in Cordoba. The Moors ruled Andalusia for 500 years and naturally they have had a huge influence on the culture. In architecture, this is reflected in the Mudejar style, which is a stylised interpretation of Arab architecture by Christian builders. How Many Days Should you Stay in Andalusia? It really depends on what you want to do or see in Andalusia. There are certainly good reasons why you could just visit Andalusia for a weekend. See it as a weekend trip destination not unlike Paris, Berlin, or Prague. Pick one of the wonderful cities such as Granada, Malaga, or Seville and really focus on just this one destination for these few days. You will find that there is enough to explore that you won’t get bored. If you have a week to spare, base yourself along the coast and plan in maybe two or three day trips to see some of the villages or the cities. From the Costa del Sol, there are many destinations you can easily visit within a two-hour radius. This will give you perfect glimpses of the rich cultural heritage of the region. Ideally, you would want to spend at least 10 days or two weeks in Andalusia, not just to occupy a sun lounge on the beach but also to plan a road trip through the various landscapes and towns between the coasts. There are endless possibilities of how you could put together a suitable itinerary. Many highlights are just 90 minutes to two hours apart and the roads are generally easy to navigate and free of traffic. Our Andalusia Travel Guide should provide you with plenty of things to choose from. Experiencing Andalusia with children is great fun. Of course, there are also plenty of water and theme parks to keep the little ones busy. The Costa del Sol is the perfect holiday destination for families. The beaches are shallow, safe and generally not very far away from your accommodation. Spaniards are friendly towards children, and the restaurants offer child-friendly options for a cheaper price. In the summer months, there are paddle boats and water parks set up in front of the beaches for added fun. Attractions such as Bioparc Fuengirola, Aqua Mijas, and Tivoli Theme Park promise fun for young and old. Some of the most enchanting day trip destinations such as Ronda, Mijas Pueblo and Malaga are easy to reach, making the parents happy too. The following hotels are great choices for a stay on the Costa del Sol with the family. Marriott’s Playa Andaluza: Resort hotel with a host of entertainment options and activities to choose from. Even includes an indoor pool for winter. Click here for reviews, photos and rates. Marriott’s Marbella Beach Hotel: Awesome family hotel with great kids facilities and a lovely warm indoor pool. Centrally located in Marbella town, with lots of shopping options nearby and the beach right on its doorstep. Click here for reviews, photos and rates. The Costa de la Luz is a wonderful family-friendly destination with glorious golden beaches and quaint little villages in natural surroundings. It’s a paradise for surfers and builders of sandcastles, lovers of great food, and nudists. The following hotels in this Andalusia travel blog post are preferred choices for families looking for a relaxed stay near the beach. Hipotels Gran Conil and Spa: A great hotel on the Costa de la Luz with indoor and outdoor pools. Lots of activities and entertainment without being invasive. Families can request rooms with interconnecting door. Click here for reviews, photos and rates. The following accommodation ideas in this Andalusia Travel Guide are great for nature lovers. Hidden Valley Andalucia: Glamping site close to the village of Alora in the province of Malaga. Perfect choice for travellers who would like to live close to animals in natural surroundings. Close to El Chorro with its rock climbing activities and the Caminito del Rey. Click here for reviews, photos and rates. Cortijo Juan Salvador: Peace and quiet in a mountain setting near Malaga. An Andalusian style farmhouse with wonderful food and a relaxed family-friendly atmosphere. Click here for reviews, photos and rates. Malaga is home to a cruise port and the most important airport in Andalusia. There are lots of great things to do in Malaga. The city is indeed an underrated gem and should be visited when staying in one of the coastal resorts nearby. If you only have a weekend to spare and would like to snack on some cultural experiences in the south of Spain, consider the following cities your best options. There are many cheap flights going to these destinations daily. Thus it’s very easy to plan an unforgettable city break to any of these cities. Things to see in Malaga include the old town with the Jewish Quarter and tapas bar El Pimpi, the mountain Gibralfaro with the two Moorish castles on top, the new harbour development with the Centre Pompidou, the Market Halls with the amazing choice of locally sourced food and fish, and excursions to the Costa del Sol, to white villages such as Frigiliana or Mijas, or activities such as a hike along the Caminito del Rey. 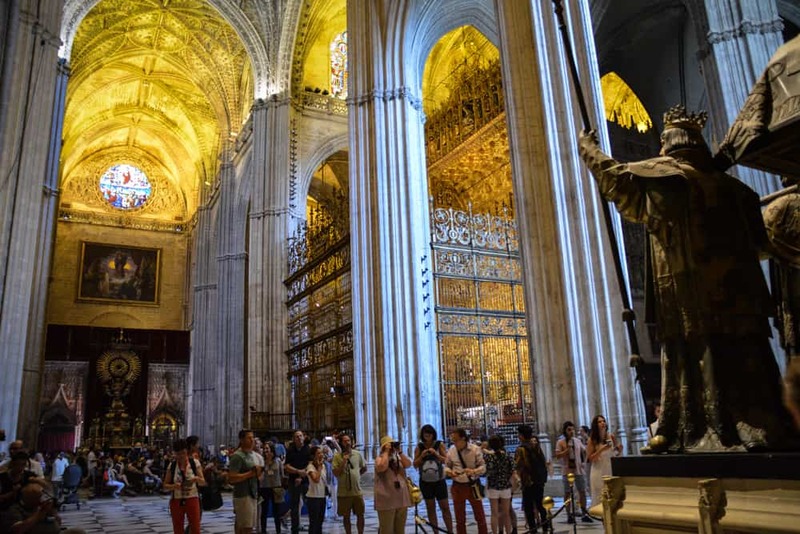 Visitors inside Seville Cathedral take pictures of Christopher Columbus’ tomb. Another great reason to visit is the over dimensional golden altarpiece as well as the views from the bell town, the Giralda. Beautiful Seville is the capital of Andalusia and also its busiest city. 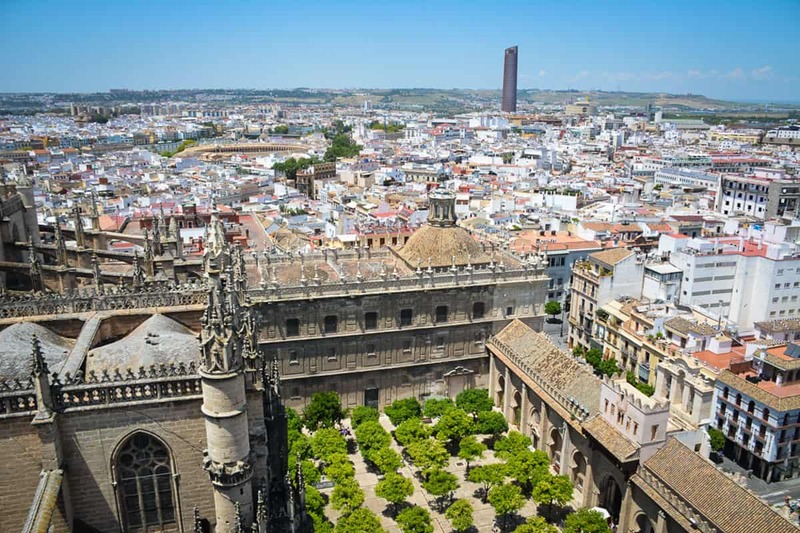 The Seville cathedral in the centre is the biggest in the world, and the Giralda (the bell tower) the best known landmark of the city. The Real Alcazar is a fine example of Mudejar-style architecture and also featured in the TV fantasy show Game of Thrones. Flamenco and sangria are best enjoyed in the old town quarter of Barrio Santa Cruz. You can visit the beautiful Plaza de Espana, climb on top of the architecturally interesting Las Setas (Metropol Parasol) or try a river cruise on the Guadalquivir. 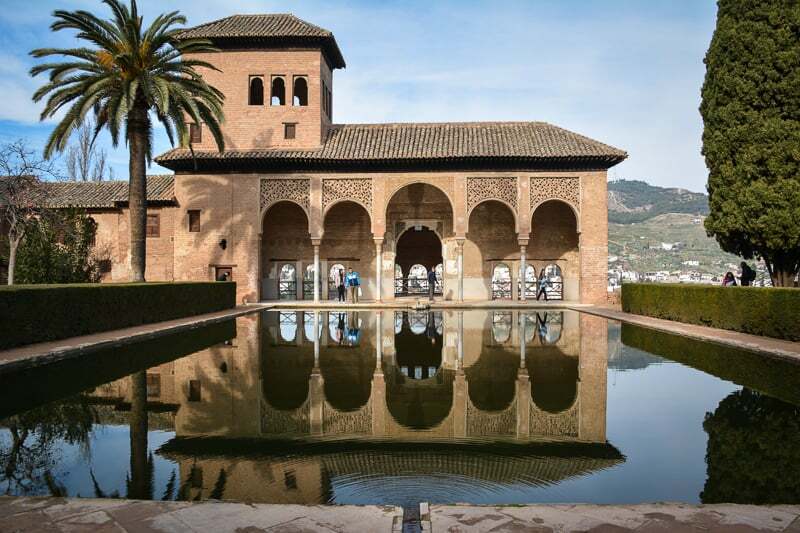 Most people will want to visit Granada to see the Alhambra, a complex of buildings and gardens so beautiful, that the Moorish rulers rather handed over the keys than see it destroyed by the Christian Reconquistadores. Highlights are the delicate artworks inside the Nasrid Palaces, the gardens of the Generalife and the views from the imposing towers of the Red Fort. Besides the Alhambra, a visit to the cathedral and the Royal Chapel next door are very worthwhile, and so is a walk in the Spice Market (Alcaiceira) and the old town (Albaicin). The latter allows views of the Alhambra with the snow capped Sierra Nevada in the far distance from its various lookout terraces. Fly to Jerez de la Frontera to see the city or venture a little bit further to Cadiz which is equally enchanting. Learn about the three things to make up the fabric of the city, Flamenco, Sherry and Andalusian horses. Or visit some of the ancient monuments such as the Alcazar or the cathedral. In Cadiz, enjoy the iridescent blue of the Atlantic Ocean which is never far. Explore the baroque city centre with the flower market, the merchant palaces and the cathedral, or walk out to the Castillo de San Sebastian for some majestic views of the city and the old port. The Lion Court at the Alhambra in Granada is an iconic picture which you can find on covers of guidebooks and on postcards. Andalusia’s cities are the perfect getaway with your partner. Feel free to consult this Andalusia Travel Guide for an unforgettable Andalusia holiday in luxury accommodation in the cities of Seville, Cordoba, Malaga and Granada. Seville: Mercer Hotel Sevilla – 5-star luxury hotel in a central location with boutique flair and a rooftop pool (exactly what you need after a hot day out in Seville!). Check here for customer opinions, photos and rates. Cordoba: Stay in the charming old Jewish quarter of Cordoba at Las Casas de la Juderia and enjoy the unique atmosphere of its century old rooms and courtyards. A central location, a refreshing pool and an honour bar make this hotel our top choice for a romantic stay in Cordoba. Check here for customer opinions, photos and rates. Malaga: Gran Hotel Miramar is the best hotel in the city. Re-opened only recently after extensive renovations, this luxury hotel will pamper you from its grand-style lobby to the roof top bar with views of the beach. Check here for customer opinions, photos and rates. Granada: Parador de Granada is a wonderful character hotel just steps from the Alhambra. If you want to sleep in a hotel that resembles a Moorish palace within the walls of the Alhambra, then this is the perfect choice. Check here for customer opinions, photos and rates. White villages like Casares were founded by Arab settlers who introduced North African building techniques to the European continent. The white walls are great to keep the houses cool in summer. The tourism board of Cadiz suggests a Route of the White Villages which you could easily follow to enjoy some of the best white villages in Andalusia. They are mostly in the Sierra de la Grazalema. However, this doesn’t mean that there were not white villages to be found in other parts of Andalusia as well. A white village is very much part of the Andalusian landscape. You will find them up and down the coast and everywhere between. The challenge is to find a white village that is close to you and that is a joy to explore. Most white villages will huddle around the ruins of a Moorish castle. They have the typical architecture of whitewashed flat-roofed houses as you would also find in the north of Africa. In fact, it was the Berbers who brought this way of living with them from Africa when they settled in the south of Spain. Narrow roads sometimes make it impossible or at least very, very challenging even for experienced drivers to navigate through the roads of a white village. Therefore, it is always best to follow the road signs with suggested public parking options on the fringes of these towns. Leave the car behind and continue your journey to the heart of the village by foot. 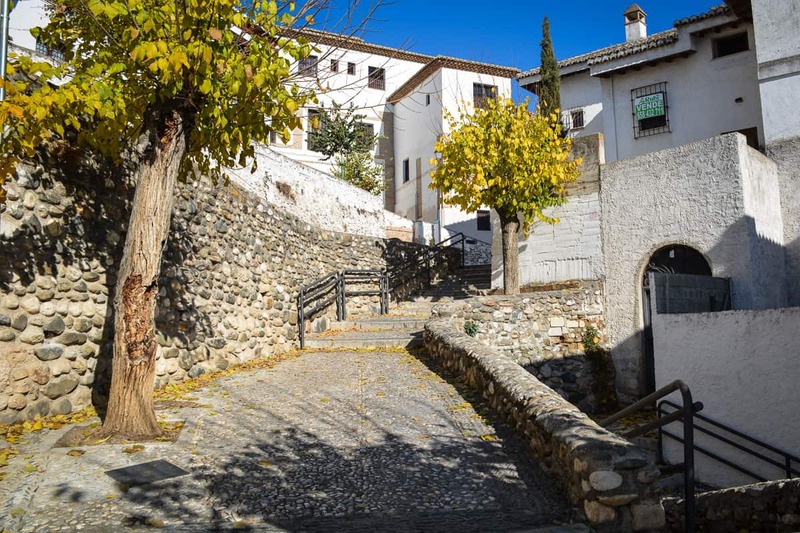 Besides the optical appeal, there are many great reasons why you should consider a visit to at least one white village during your stay in Andalusia. White villages are excellent destinations as a launch pad for active tourism. They are incredibly romantic. You can still find family-run businesses selling original, home-cooked meals with hearty flavours. Some of the best souvenirs, thick carpets, decorative plates, handwoven baskets, but also culinary treats such as olive oil, ham, cheese and sausages, can only be found in white villages. Read here which white villages in Andalusia we recommend! Colourful pots and flowers for sale in Mijas. 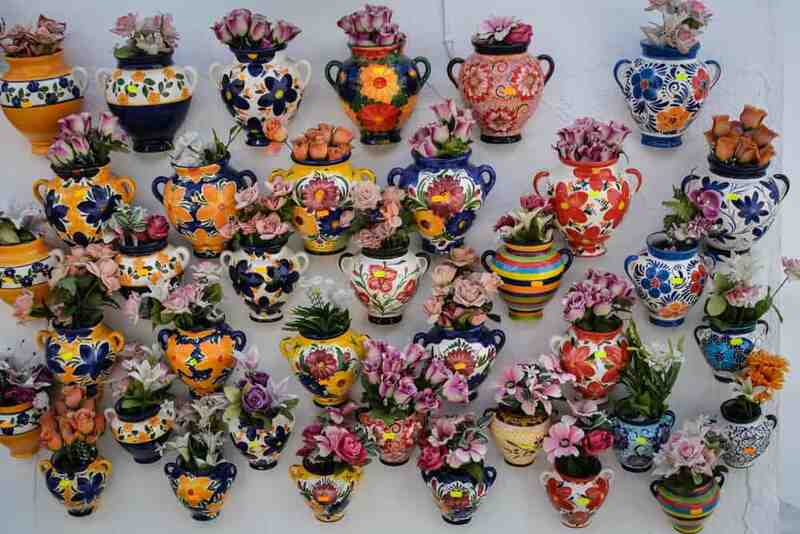 Spain has a long ceramic craft tradition. It’s hard not to go home without at least one handprinted tile or plate in your suitcase. Mijas is a picture-perfect and completely modernised white village near the tourist centres of the Costa del Sol. Offers great panorama views from its many terraces. 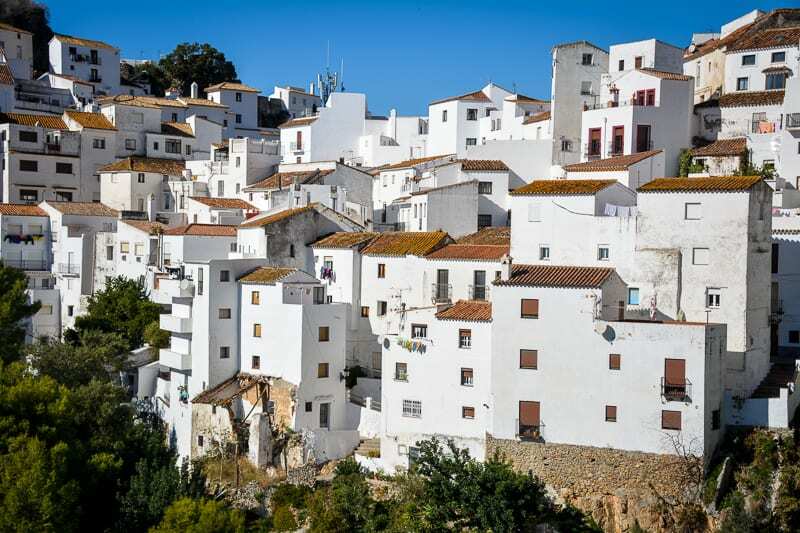 Whitewashed houses arranged in a semicircle on a cliff overlooking the river – this is Arcos de la Frontera. There are fortified mansions and two churches to explore. Ronda is definitely much busier than most villages and rather qualifies as a town. Views of the Tajo Gorge, the three bridges spanning across and a number of Moorish palaces make Ronda a worthwhile day trip destination or stop on a roadtrip. A village with cave dwellings which have been built underneath rock ledges along the riverfront. Read more about it here. 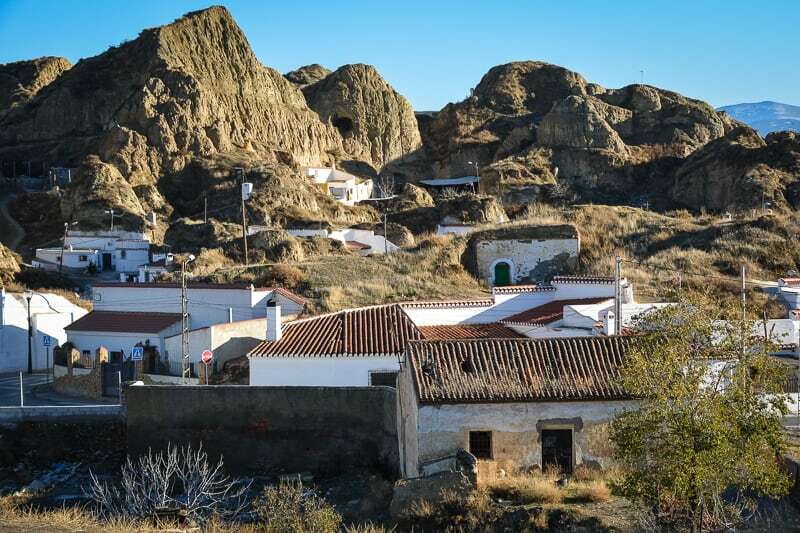 Views of Guadix with its cave dwellings. Some locals will invite you to have a look inside their houses (they are actually quite comfy! ).One of our top tips for our Andalusia Travel blog. Cave dwellings dug from the soft limestone, former homes of gypsies and artists, today open to visitors. There is a small museum explaining the history of the local people and their interesting lifestyle underground. More about Guadix. Not just a village but a region of villages which used to be the last retreat of the Moors after the Reconquista. You can still make out the cultivation terraces which are irrigated with water from the Sierra Nevada. Try the hams of Trevelez and travel as high up as possible for an authentic atmosphere. More about the Alpujarras. The town is located in the nature park of the same name and is nestled in a lush valley. There is an interesting Traditional Textile Museum. A stunning village on a steep hillside which is famous for its many festivals, in particular the Fiesta of Corpus Cristi around Easter. White houses tumbling down the slopes below a castle as if they were stacked sugar cubes. Enchanting views from the neighbouring hill. More about Casares. 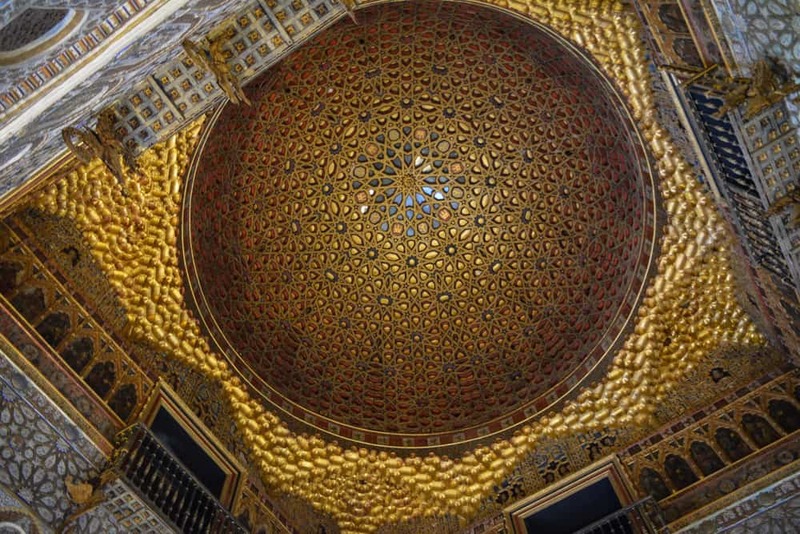 The stunning golden dome in the Hall of Ambassadors at the Alcazar in Seville. One of the top things to see on an Andalusia Holiday. Hands down the most stunning attraction to see in Andalusia and consequently very popular with international visitors. Tip: If your preferred dates are already booked out, there is still a chance to join a guided tour. 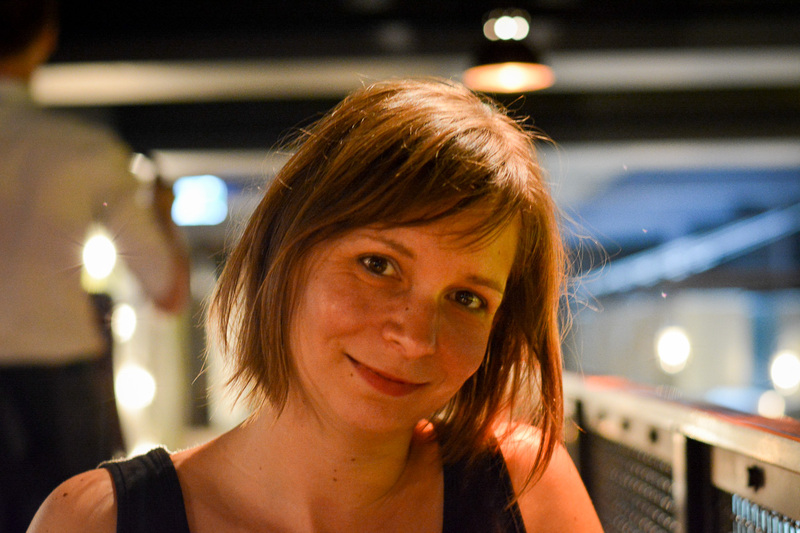 Websites like GetYourGuide will give you a couple of options to choose from, even last minute. While this may be the more expensive way to see the Alhambra, it would be very foolish not to pay this world-class monument a visit while you are in the area. 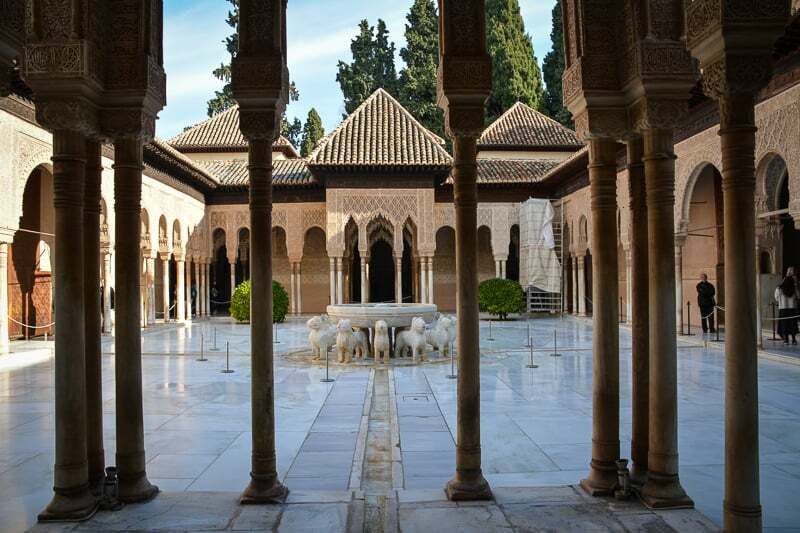 If there is just one attraction you would like to see in Andalusia, make it the Alhambra. You won’t be disappointed. Nowhere else in Andalusia will you see such an emblematic combination of Moorish and Christian influences. The Mezquita is the old mosque of the city. Thankfully is was not eradicated to make way for a cathedral as it was the case in most other cities. 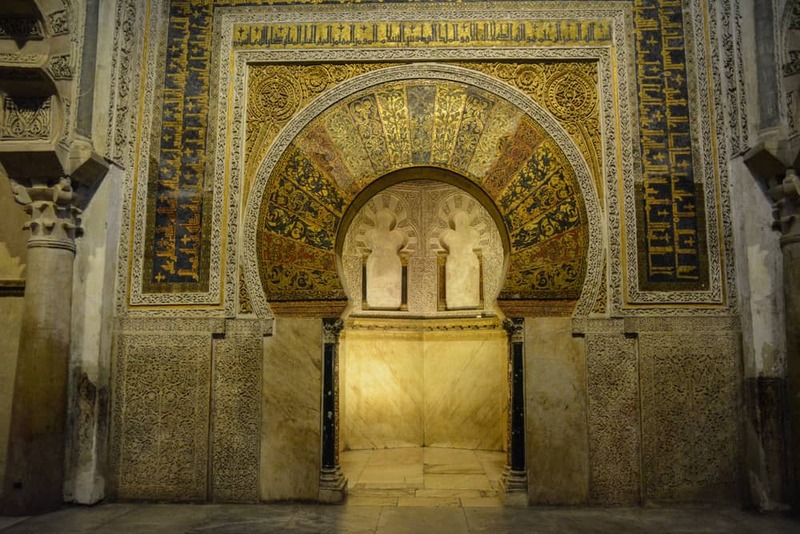 The mezquita has many typical Islamic features such as the horseshoe shaped gates, the orange tree courtyard, calligraphy along the walls, and a mithrab niche. The hundreds of columns inside, sourced from Roman sites all around the then known world, are a symbol of the city of Cordoba. The biggest surprise, however, is the cathedral in the centre of the mosque. It is equally stunning and in true juxtaposition to the Moorish hall surrounding it. Royal palace that is even today still in use by the Spanish Royal Family when they are in Seville. We strongly recommend you book your tickets to the Real Alcazar in Seville in advance. Also, have a Euro coin ready for the locker as you will not be allowed to bring in large bags and backpacks. It’s best to visit either first thing in the morning or later in the day to avoid the worst of the heat and the crowds. Don’t rush the experience, the gardens alone will take you at least an hour to explore. Click here to read everything you need to know before visiting the Real Alcazar in Seville. A three-hour hike through two steep gorges, following the old trail left for workers who built two water reserves in the area. This is one of our most favourite things to do in Andalusia, hence it deserves a mention in our Andalusia Travel Guide. Today, the walkway of Caminito del Rey is entirely modernised and secure. But this doesn’t make the walk not less of a dare. Hanging in 100 meters above the ground you get the best of the views and the sounds of the gurgling river underneath your feet, while there is not much more than just you, the blue sky and the songs of the birds. More info and planning tips for the Caminito del Rey here! Selection of typical Andalusian foods. Fish, cured meat, cheeses, fresh fruit and vegetables are part of a true Andalusian diet. Please don’t go on an Andalusia holiday and only dine on British food! There are so many great things to explore. Some of them are available only in a certain region, but many of them universal to the whole of Andalusia. The south of Spain is one of the most productive regions in terms of agriculture. 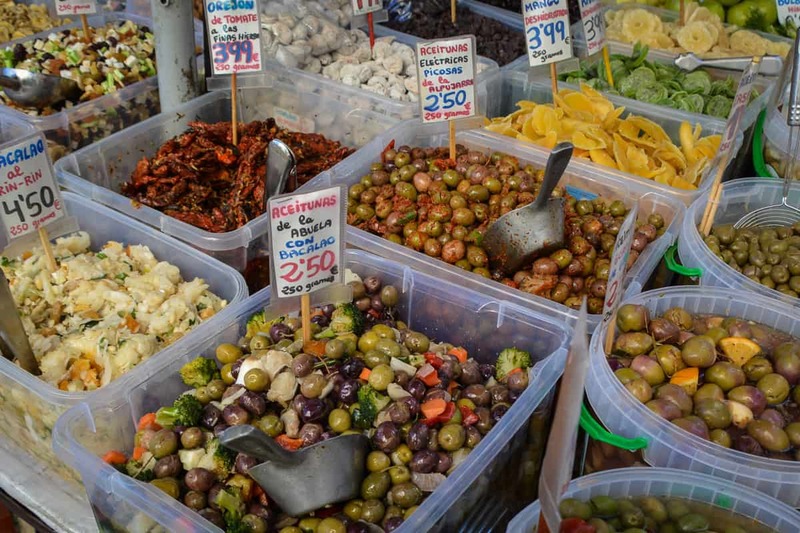 Fresh vegetables and fruit are very much part of the Spanish diet. Just think of the cold soup of gazpacho which originates in Andalusia, ajoblanco (made of garlic and almonds) or porra (a chilled tomato soup). Don’t miss the thousands of orange trees which line the streets of every city and soak in their sweet aromas. Olive trees are another very common tree that dot the landscapes. Olive oil is probably the most important ingredient in Andalusian cooking. Have your beer with a small serving of olives infused in fresh herbs or lemon peel. If visiting from September to April, be on the lookout for a locally grown and consumed custard apple named cherimoya. It has a deliciously sweet flavoured flesh. Besides this, do try some of the fish and seafood that is available along the coast. Don’t go past the grilled sardines that are grilled over coals on the beaches of the Costa del Sol. Finish your holiday with a paella in one of the chiringuitos (beach restaurants). Try some locally caught tuna in Zaraha de los Atunes (yes, that’s why its called that way), or order some tapas with bacalao in Cadiz. Personally, I loved boquerones (little sardine fillets in vinegar) ever since I was a little kid. A bottle of sherry is always a great souvenir to take home (consider customs restrictions and don’t go overboard with your purchases). And so are locally produced vermouth, gin, and sweet Malaga wine. If you are visiting in December and January, buy some Christmas treats named mantecado in one of the supermarkets. They are super cheap and very tasty, with delicate almond flavouring. You can choose from a variety of tastes such as citrus, chocolate, and cinnamon. There are so many things to see and do in Andalusia, it would be a shame to miss it. If you would like to know more about unusual things to do in Andalusia, continue here. For a list of other Andalusia travel articles with lots of tips and ideas, click here. As you can see, an Andalusia holiday would be a great idea all year round. When will you come and visit?